As investors, we ensure that we know where we put our money so we do a little research on the background and business of the company we will be investing in. In our Stock Favorite today, we will feature one of the companies I am investing in. It is one of the companies that is very much familiar for Filipinos. Adding to our list is the very famous SM Prime Holdings (SMPH). It has malls operating in Philippines and China. To date, SM Megamall has become the largest mall in the Philippines with the addition of the Mega Fashion Hall. In 1994, SMPH is publicly listed in the Philippines Stock Exchange. Taken from SMPH's profile in COL Financial's site, its subsidiaries are First Asia Realty Development Corporation, Premier Central,Inc., Consolidated Prime Dev. Corp., Premiere Southern Corp., San Lazaro HoldingsCorporation, First Leisure Ventures Group, Inc., Southernpoint Properties Corp., MegaMake Enterprises Limited, Affluent Capital Enterprises Limited, SM Land (China) Limited,and Springfield Global Enterprises Limited. To buy shares of SM Prime Holdings, just look for the stock code SMPH. Board Lot identifies the minimum number of shares that can be bought. It also indicates the increment of share amount that is allowed. This means that an investor is only allowed to post a buy order for a minimum of 100 shares. If the investor has more funds, he or she can buy more than 100 shares with an increment of 100 shares as well. So this will be 200, 300, 400, and so on. The system will not allow the investor to put in 150 shares or 220 shares in the buy or sell order in the main board lot. 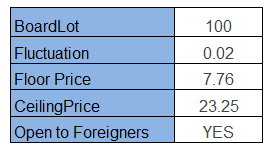 Fluctuation indicates the buying or selling price to be in multiples of 0.02 pesos. The investor can post 6.5000, 6.5200 but not 6.5100. The floor price dictates the minimum amount that the buyer can put as a buying price or the seller in the selling price. The system does not allow the user to put amount lower than 7.76 Php. The ceiling price dictates the maximum amount that the buyer can put as a buying price or the seller in the selling price. The system does not allow the user to put amount higher than 23.25 Php. Foreign investors are allowed to purchase shares of SMPH. With the current price of SMPH, it is still cheaper than the fair value. As a long time investor, this stock is still flagged to have a BUY rating. For more guidance on what stocks to buy and when to buy or sell them, you can seek for assistance through Truly Rich Club. Know more about Truly Rich Club here >>> TRULY RICH CLUB. At this moment , It is a significant and informative website about financial market.It is a very useful for us. So, I like it very much. Many many thanks for make this website. If you want more informastion about stock screener to visit stock screener The advantage of these stock screeners is they allow for a vast amount of customization by the user. That same advantage can create a disadvantage for some users. Those users may not really know what they are looking for or what data criteria might produce a screen of stocks that present the highest possible probability of a successful stock trade.